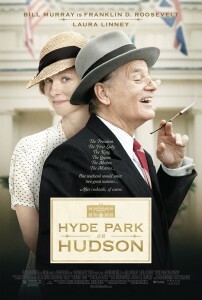 Depending on how you look at it, Hyde Park on Hudson could read as relevant or redundant, so close as its release to the phenomenon of The King’s Speech is. Along with being just as handsomely innocuous as 2010’s Oscar victor, this multi-tonal, 1939-set costume dramedy features Samuel West as the stammering King George VI, who, along with his wife, Queen Elizabeth (Olivia Colman), treks to America, seeking support from Franklin D. Roosevelt (Bill Murray) just months before World War II. The visit was a major milestone, as never before had a British monarch set foot on American soil, but with so many downsized versions of familiar elements (the King’s embarrassed outbursts over failing to finish sentences; for instance), this movie often feels like a ‘King’s Speech’ spin-off, tangentially cashing in on the hype of a certain flawed hero. The world explored in Hyde Park on Hudson is one of copious juicy secrets, the least tantalizing of which is the lesbianism of Eleanor Roosevelt (Olivia Williams), who occupies a separate cottage on the family’s titular New York estate, making furniture with “the sort of women who like each other,” as the royals’ butler puts it. The real dirt, tucked away in an era when even the president’s need for a wheelchair was kept private, concerns FDR’s handful of mistresses, particularly Daisy (Laura Linney), who narrates the movie and also happens to be the big man’s distant cousin. Written by playwright Roger Nelson, Hyde Park on Hudson is largely derived from Daisy’s diaries about the affair, unearthed after her death in 1991 at the age of 100. In the film, she cozies up to the president while he’s also bedding his secretary, Missy (Elizabeth Marvel), a tough pill for the smitten Daisy to swallow, especially after she’s given him cinema’s most PG-rated flirtation with R.
The circus of indiscretions is witnessed on the sly by the visiting king and queen, who offer dishy commentary like ardent Bachelor Pad viewers. But, on the whole, the movie vexingly glazes over the highly provocative content, with director Roger Michell preferring to whip the proceedings into as frothy a jaunt as possible. Played for predictable, dated laughs, the king and queen’s stay on U.S. soil sees them starkly juxtaposed with the easygoing American way, their noses goofily aloft. There’s tenderness in the president’s heart to hearts with the reluctant king, primarily of the surrogate-father sort, but there’s also plenty of room for him to comment on the U.K.’s lack of a voting system, and instill in his comrade some good-old-Yankee repose. Franklin’s testy mother, Sara (Elizabeth Wilson), is up in arms about her son’s insistence on serving the royals alcohol, but everyone’s just fine with serving them hot dogs, the ultimate no-frills belly-filler, and, perhaps, a little phallic jab of announcing one’s territory. As the troubled mistress, Linney is as good as her viewers have come to expect, and she’s gifted a pulse-quickening revelation scene that’s better than anything else in the film, but to hear her finally recite Daisy’s acceptance of FDR’s taste for multiple flavors is like listening to a cutesy manifesto from a wife on Big Love. Mentally juggling this mess of narrative components, one nearly falls numb to the comely cinematography by Lol Crawley and nearly forgets that Murray’s portrayal is supposed to be one with ample Oscar buzz.